O ! throw me in wi' speed. As fair Jenny in her green mantle, To Milecross she did gae. This lady was as glad at that As any earthly thing. But quickly she ran to the milk-white steed, And pu'd the rider down. For she's taen awa the boniest knight In a' my companie. No. 345. Aften hae I play'd at the cards and the dice. 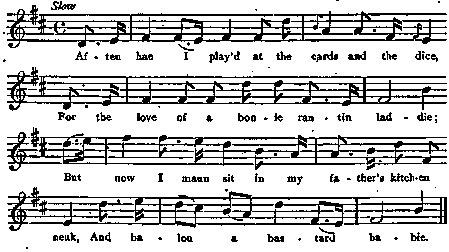 Tune : The rantin laddie Scots Musical Museum, 1796, No. 462.